Your character is a robber who runs around a mine collecting moneybags and depositing them in a wheelbarrow at the top of the screen. Climb ladders and ride elevators to avoid two angry miners. Grab pickaxes to temporarily stun your pursuers. 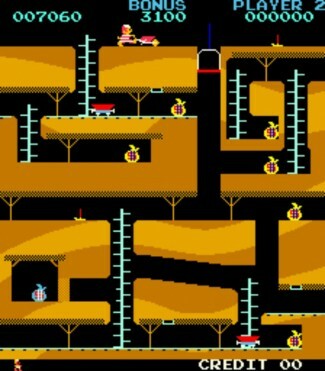 The mine is three screens wide and scrolls as you move around. You must grab a bag of gold and carry it up to the surface and place it into the wheel-barrow and you must do it before the bonus points on the timer run out. Everytime you pick up a bag of gold, it will slow down Bagman to half speed allowing one of the two cops to easily catch up to him. If you are carrying a bag of gold while climbing a ladder and a cop is pursuing you, you can drop the bag of gold on the cop’s head to temporarily put him out of the way. Another way to stop a cop from pursuing you is by picking up and using a pick-axe to stun him. The pick-axe can also be used to dig a big hole in a wall. You can also escape from each of the cops by getting into a minecart but the minecarts can kill you, if they run into you. Avoid moving minecarts by grabbing handles on mineshaft roof. Then let go of the handles when the cart is below you to ride the cart. To get out of the cart, you must grab another set of handles on the roof as soon as you are under them. You can also use the elevator to escape the cops and the elevator will also help you reach the surface quicker, especially if you are carrying a bag of gold. Most of the bags of gold are yellow, but there is a blue bonus bag of gold that is behind a wall that can only be penetrated by a pick-axe. Even so, the bonus blue bag of gold is twice as heavy as the standard yellow bags of gold but also worth a greater amount of points.